...is singing loud for all to hear! 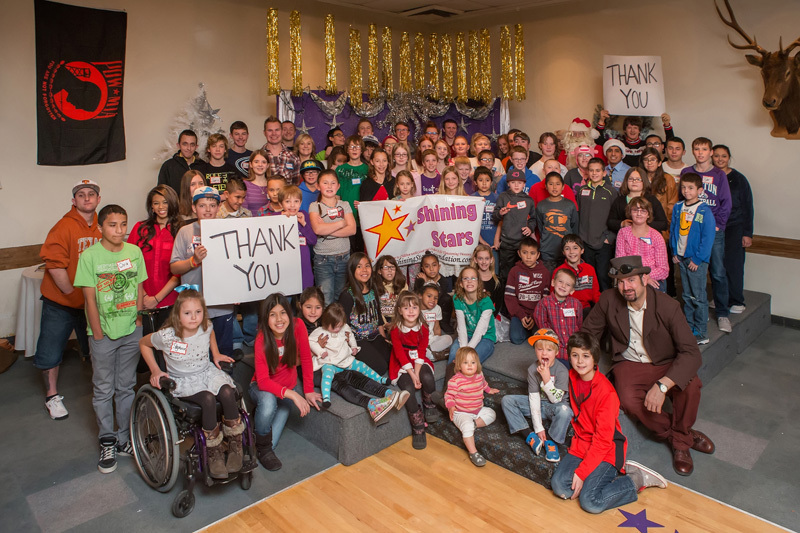 We won't subject you to our singing voices BUT we would like to sing the praises of all those who helped make the 2014 Shining Stars Holiday Party and Toy Drive a huge success. We filled over 60 toy boxes throughout the Aspen, Grand County and Denver areas and collected our largest haul of toys yet! It was a good thing, too, because we hosted over 200 children and families at the Shining Stars Holiday Party on December 20th. The Lakewood Elks once again generously donated space to host our event, and the Denver Rotarians, along with a very special group of volunteers, turned out in numbers to help unpack toys and greet families. Check out all of those toys! The look on faces of our Shining Stars as they entered the ballroom was absolutely priceless. Our guests were greeted by the holiday vocal stylings of "Soundz Familiar" and later enjoyed a magic show by Magician Keir Royale. Santa Claus himself was also there to take any last minute toy requests! When asked what the holiday party means to their families, check out what some of our Shining Stars parents had to say..
"The party was amazing and to us, it's like coming to a family event. Since our son has a compromised immune system, he doesn't go to public school. This is the only holiday party he gets to attend and it's truthfully the only one he wants to attend. Being around all these other families who "get it" makes it the most relaxing wonderful place to be. THANK YOU!!!!!!!!!!!!!!!!!!!!!!!!!" - Shining Star Mom, Sarah. "To all the generous hearts who donated to the Holiday Party, thank you! Our children's eyes were huge when they saw all the toys they got to choose from. Christmas is so important to us on many levels, but it can be a huge financial burden with 4 children and a life threatening illness to battle. I hope that you are feeling the joy of giving, because you have given this family a lot. Generosity is contagious and we are all moved by your kindness. Have a wonderful and most importantly healthy holiday." - Shining Star Mom, Kim. We are so incredibly grateful to all those who have helped us make this holiday extra special for children with cancer or life-threatening illness and their families! Stay tuned for more photos of the event, coming soon! Newer Postit's Winter Games eve!